Braai popped up over the past few weeks as a good spot for brunch in Hell’s Kitchen. I was intrigued after reading the menu. Initially a little confused about when they served brunch (I read somewhere that they only served brunch on Sundays but OpenTable allowed me to make a reservation for Saturday. ), after a quick call to the restaurant I learned that they just started serving brunch on Saturdays, this past Saturday being the first. Naturally, I was more than happy to help support them in this expansion. 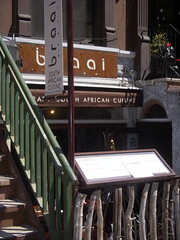 Braai is an African restaurant. Their brunch offerings ranged from $8-$14 and ranged from the more standard fare of French toast (or “Hugenot Toast”) to the more exotic, such as their Ostrich Benedict. 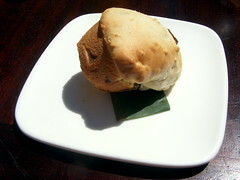 Before your main course comes out, they bring you a plate of small fresh scones containing some sort of currants. They are served with fresh butter and apricot preserves. Following that we received a small bowl of African porridge which is very similar to grits with a thin layer of sugar (just how I love them!). 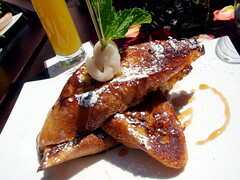 I went with their french toast served with a rooibos (redbush) syrup. It had a sweet taste with a bit of tang to it. It’s hard to compare but I’d say something akin to cranberries as a frame of reference. My only complaint with my french toast would be that there was more roobias syrup; It was so distinctive that I wanted to taste more of its flavor. My friends both went with the Safrikan Brekkie. 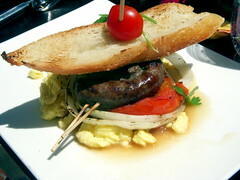 The dish had many elements: boerewors (a fresh lamb sausage), eggs, fried tomato, grilled onions, baked beans, and toast. They were sold at lamb sausage. Both said it was really flavorful and definitely filling. A nice beverage option available are their mimosas. For an additional $8 per person, you can have unlimited passion fruit mimosas. The mimosas are served with passion fruit, champagne and orange puree. If you’re lucky they will run out of the passion fruit and allow you try other purees not on their menu. We had the opportunity to try their pear mimosa (my favorite) as well as their guava. Excellent service and great value for your money. And with temperatures on the rise, you can also take advantage of their limited outdoor seating. As a wine bar they also offer fantastic happy hour specials that includes an interesting array of reasonably priced appetizers. We will be back soon to check those out.